Hi lovelies! I'm back today with guess what? 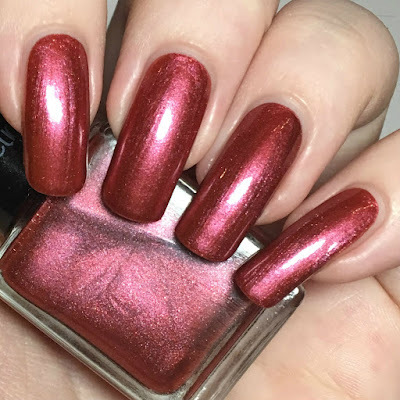 Another Christmas mani! This time I have stamped some candy canes over another Vegan Beauty Cosmetics polish. I've been really loving the shimmery foily finishes of them all of this month. Read on for more info! I started off with a base of Vegan Beauty Cosmetics 'Burnt Rose' (swatched here). I can't seem to get enough of red polish this month, it's just so Christmassy! Below is two coats and topcoat. To add my candy canes, I used Uberchic Beauty stamping plate Christmas-02 (purchased from Nail Artisan). There are two candy cane images on the plate made for layered stamping, but as I already had the red from my base colour, I only used the second image - with the 'full' candy canes with outlines. 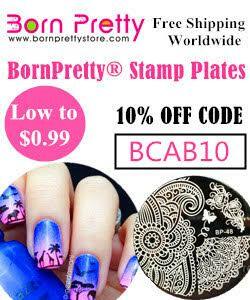 I stamped onto each nail using my Born Pretty Store clear stamper and Hit The Bottle 'Snowed In'. What do you think? I really like them. You can't have Christmas without candy canes - although shockingly, I haven't actually had any yet this year! I don't think I've seen any either. I'm going to have to go on a candy cane hunt very soon! I really like the pattern the canes are in! love this! i've been meaning to use a stamp image i have just like this! Your stamping is perfection! I still make mistakes but your image is super clear! Beautiful stamping and so perfect on that shade of polish. That's some fantastic stamping!!!! I hadn't heard of the base color brand before - it's a very pretty red! So fun! I love this stamp. Your candy canes are so crisp! Haha! I haven't had any candy canes this year either. 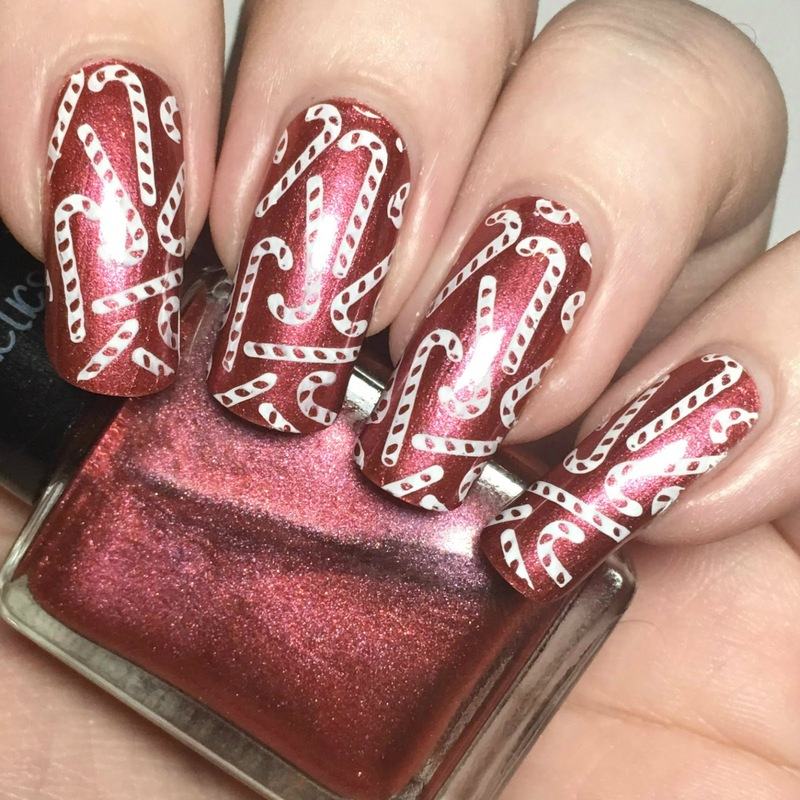 This is a fun and festive manicure! The stamping is everything here! I love the colors and details. Very festive. You do great stamping ! This is so cute!!! 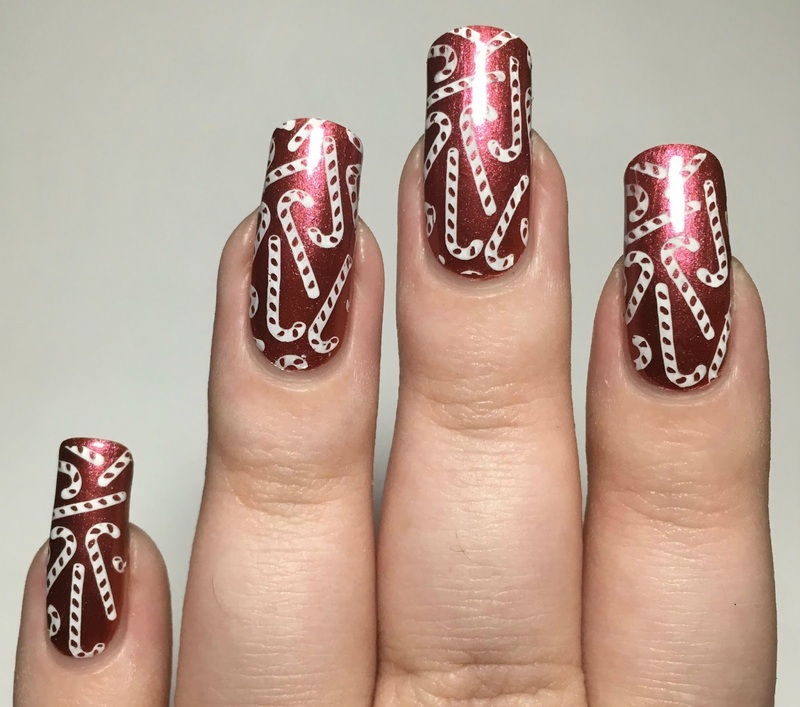 That stamping is flawless! This mani is so adorable!